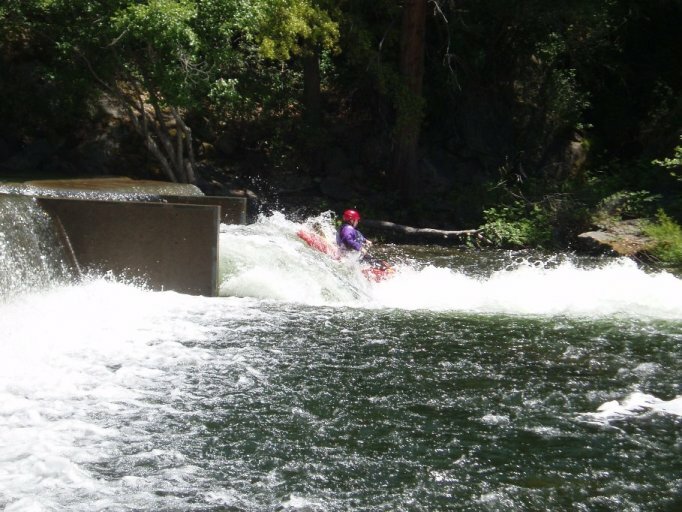 So American Whitewater arranged notified the boof community that there were going to be releases on this stretch of river and as I hadn’t ever done it, I jumped at the chance. It also helped that that weekend there were very few other choices of what to boat. But anyways, so I rallied some support and we headed down there for the last day of the first weekend of the release. 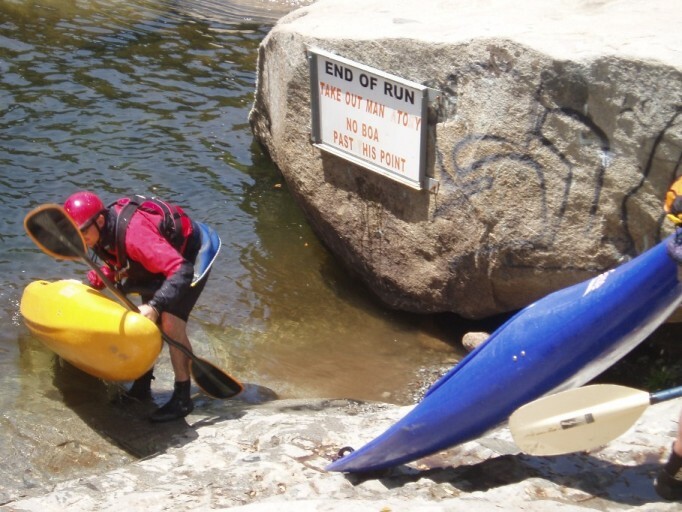 I had read a little about this run, but could find no pictures and no detailed information about the rapids themselves besides that the river ended in the biggest drops of the day. With this info I wasn’t expected much of a day, I had it in my mind that the scenery would rival that of the Main Cosumnes. Lucky for all of us, this was quite wrong. The scenery was awesome, nice granite slabs, moss covered rocks, forest and wildlife this run impressed. 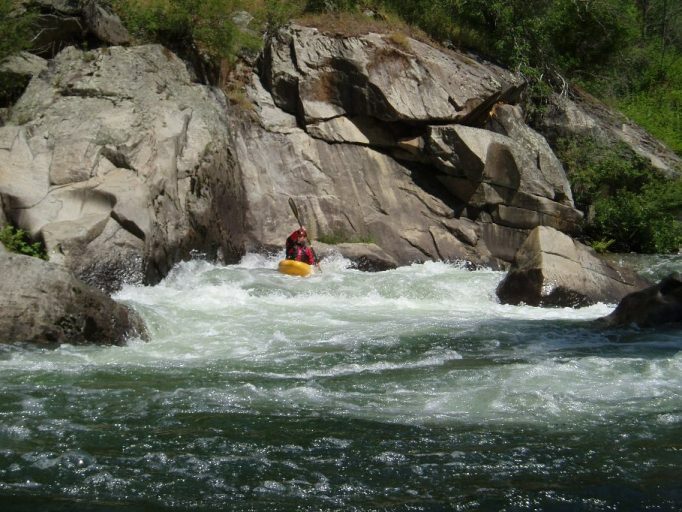 The rapids were fun, nothing to write home about, but fun. 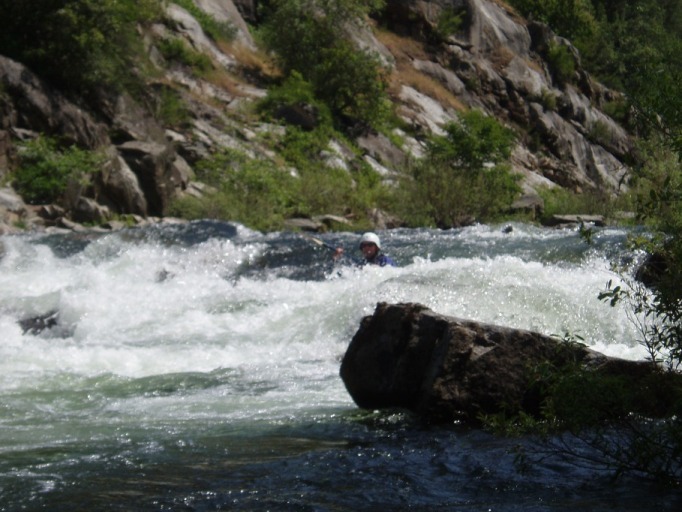 For the most part the rapids were class III. 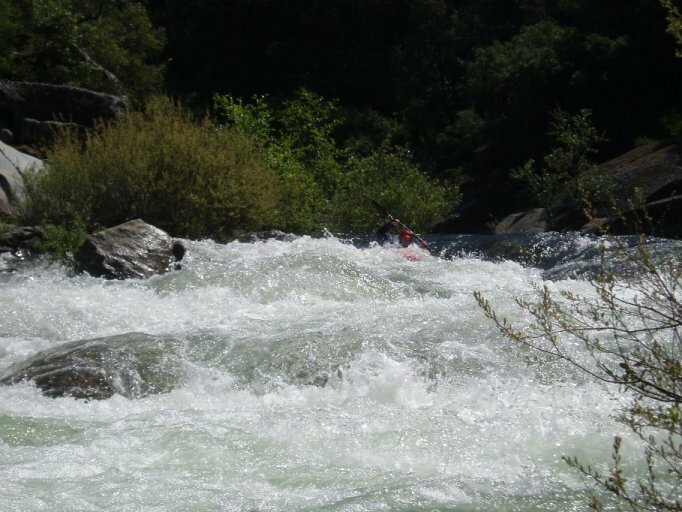 There was one long class IV- at the beginning and then a hard two part rapid at the end. 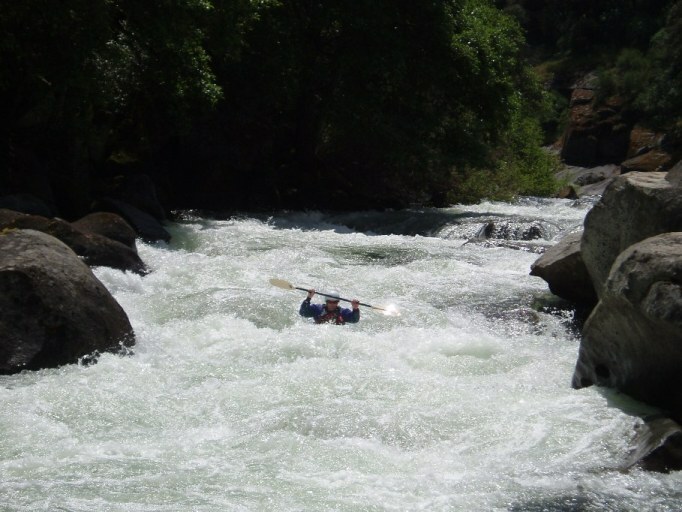 I would say this run at 700 cfs is a great intro to creeking run for a solid class III boater who can handle class IV. 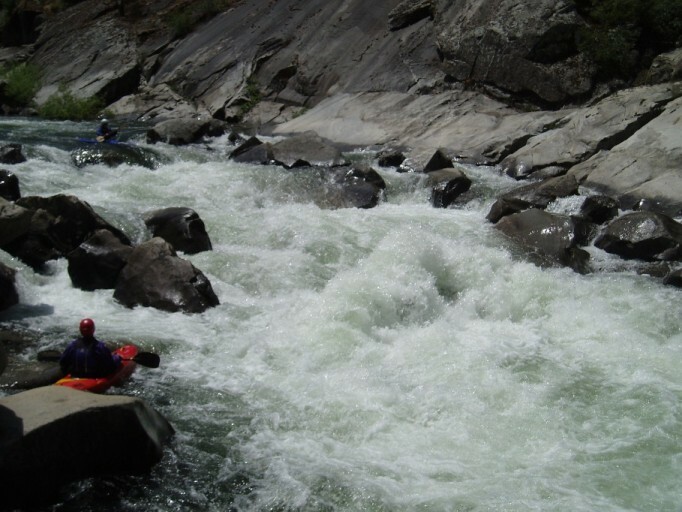 The rapids were long at times and a flip or swim would be a ordeal. 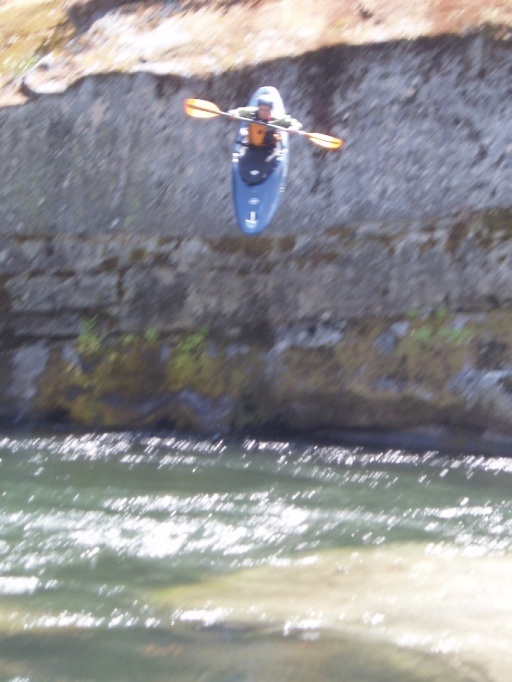 Also, the last rapid would be a challenge to portage as the rocks are very slick. I know it is possible with a rope for an IK, but I am not 100% sure about what you would do with a hardshell. All in all, this was a great run, provided us with plenty enjoyment for the day, and I hope that AWA lands us fulltime releases on this reach of river. Low Dam (IV). 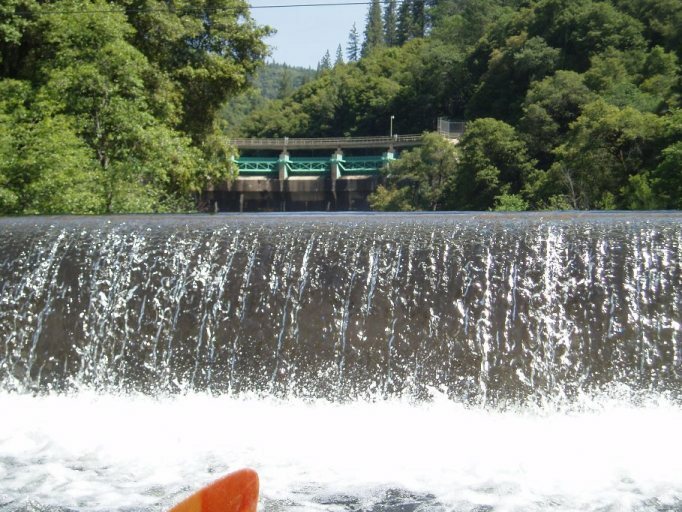 There is a low dam which has a channel in the middle. One guy in our group got the guts to run it and did fine. The water goes deep and creates a very large hole, one that scared the rest of us away. 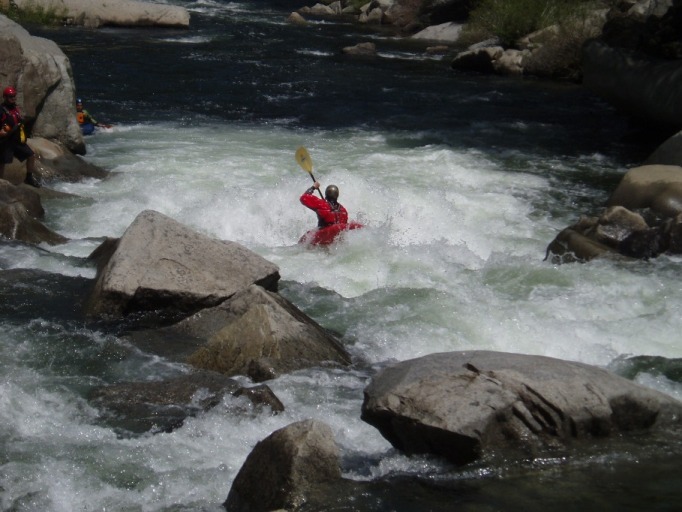 First Rapid (II+). 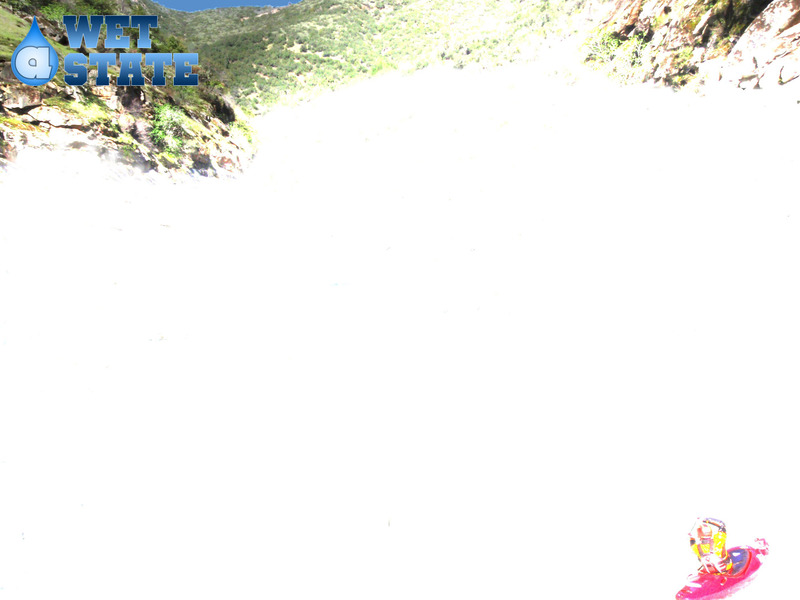 The first rapid was a little chute on the left, easy to read and run. Cushion (IV-). 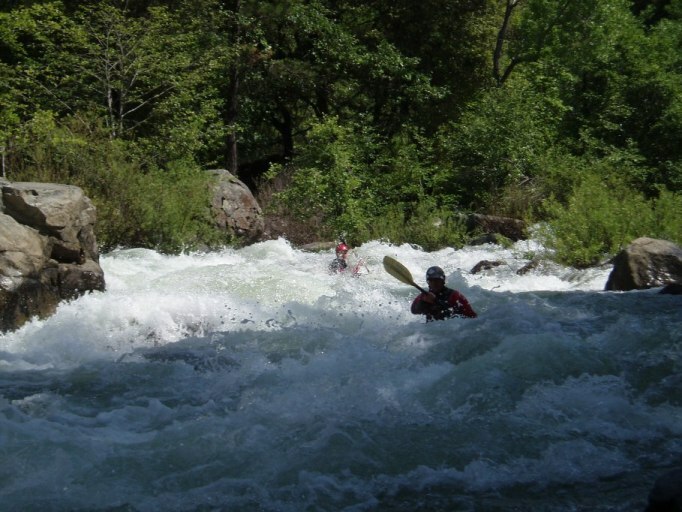 A long rapid drops in three parts. The first part is read and run boulder bar. The second part drops over a rocky shelf and leads directly into the next part which is the trickiest. The river makes a 90 degree turn and on the corner the river drops over what looks like a pour over, only there is a rock just behind it that could cause someone a lot of pain. Slot on the Right (III). 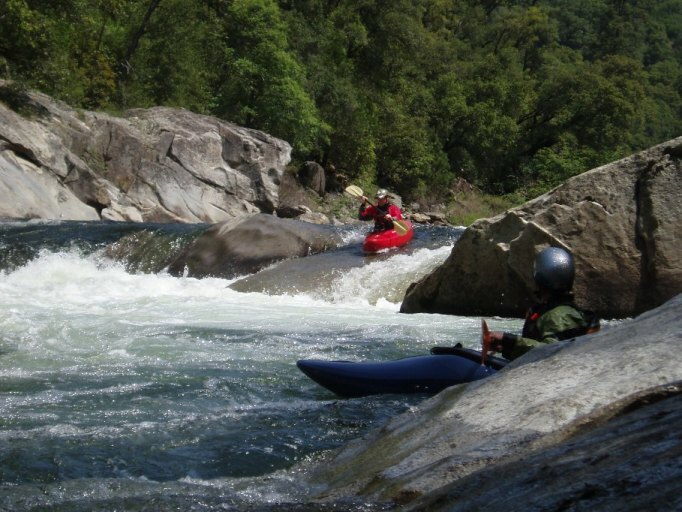 A fun rapid seems like it is going to be harder than it is. 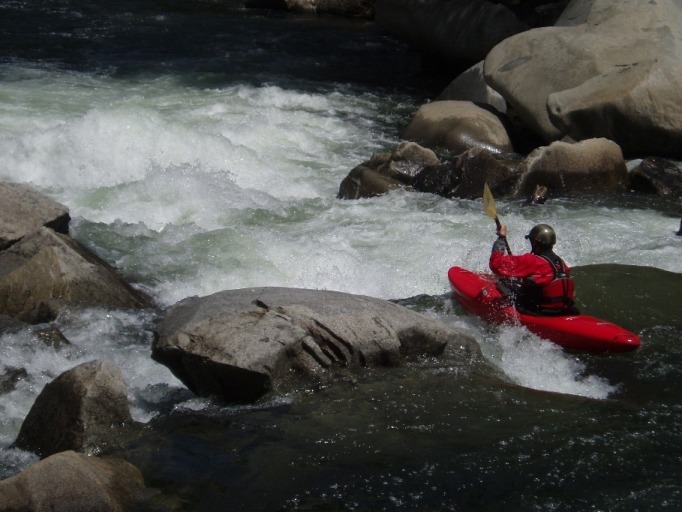 The river disappears behind a bunch of boulder in the river. Working to the right shore a channel appears. The line is to drop into the first hole, and run the chute out. The rapids ease up, but a few stand out. Minor Jumble (II+). The river has a surprisingly large horizon line for such a small drop. There is a nice clean line on the left shore just to the right of a flake rock. Boof or Slide (III-). Two clean choices exist, on the left channel is a nice slide and the middle channel is a nice 4 foot boof. 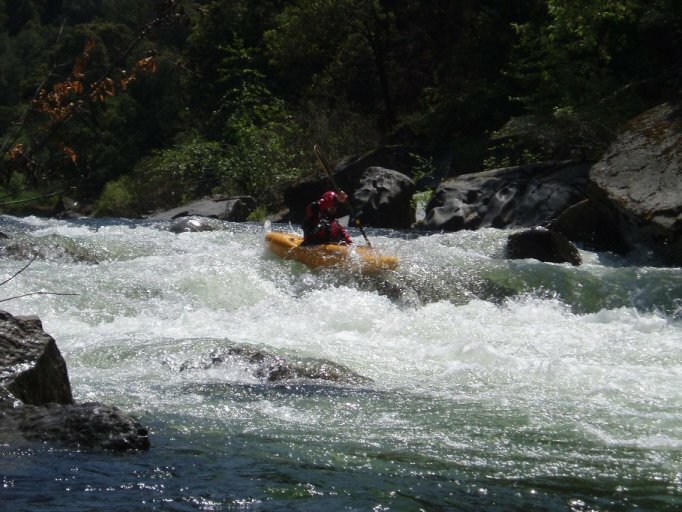 Just avoid right of center as the water slams into a flake rock. Several Holes (III-). The river drops and several holes are punched. 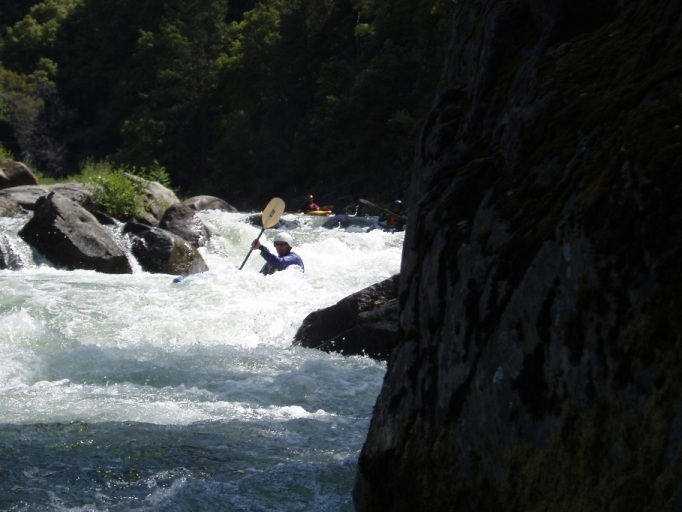 The rapid is not all the difficult, but there are plenty of rocks to trip up on. Ledge (III-). 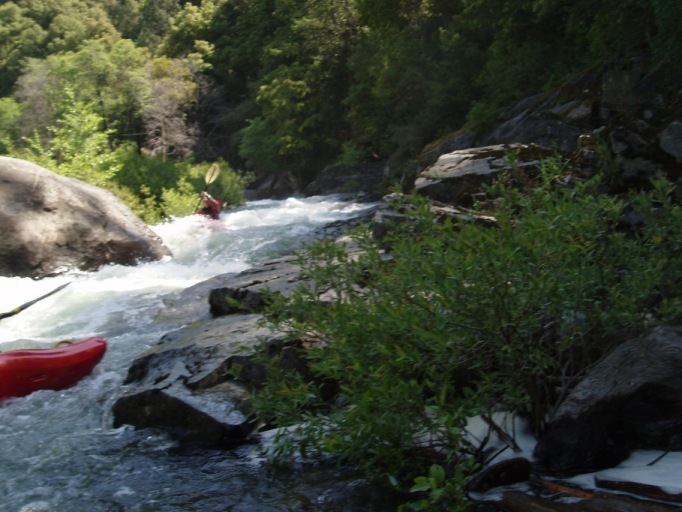 This is one of the steeper rapid for this section of the river. The river drops over a ledge which can be avoided on the right. The center could be boofed at out flow. The left however look tame but ended up being a much larger hole than any of us expected, still fun though. 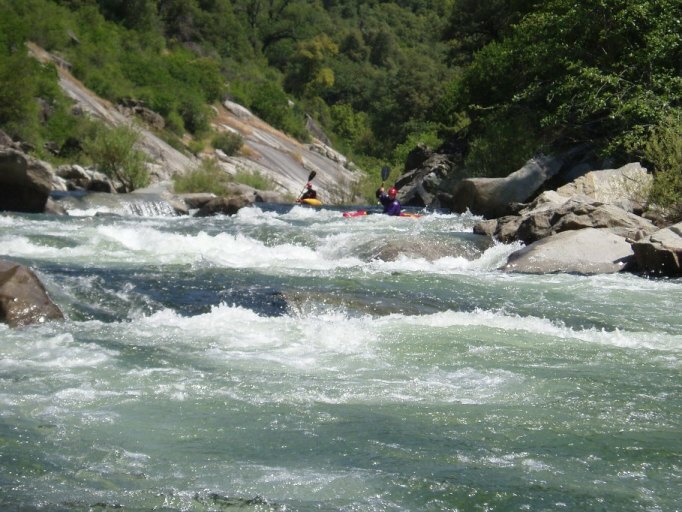 When you see a nice granite slope coming down into the water, you know you are getting close the last stretch of rapids which also are the hardest on the run. The are just around the corner. Entrance (IV). A small entrance leads to an eddy on the left. This is a good place to scout from. The line is down the right at the beginning through several holes. Then cut left away from the sieves and shoot the large hole at the end. There is an eddy immediately below the hole on the left. If you don’t catch this, run center down the next ledge drop which has a funky sideways hole at the bottom and eddy out on the left just above the next rapid to scout. I am adding a little to the difficulty of this rapid because of the consequences that lay downsteam of it. Take out: From Jackson take Highway 88 some 12 miles or so. Before entering the town of Pioneer turn right on Highway 104/26 also called Red Corral Road. Follow this a short distance down to the river. 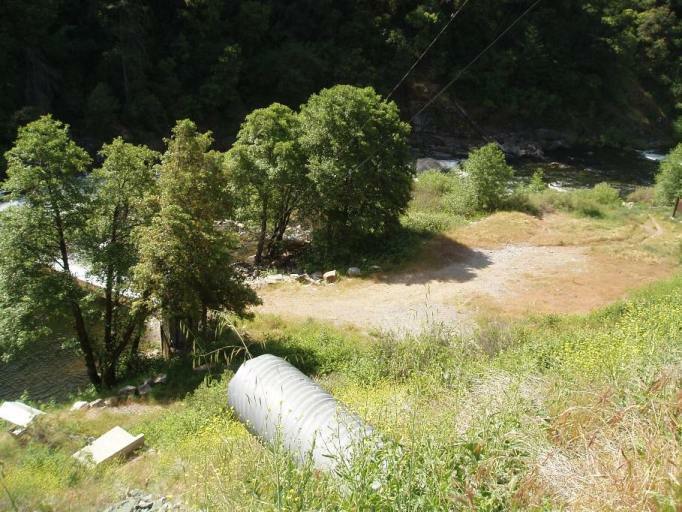 100 feet before the bridge that crosses the river you will see a chunky cement road leading steeply up from the highway on the left. Take this road. 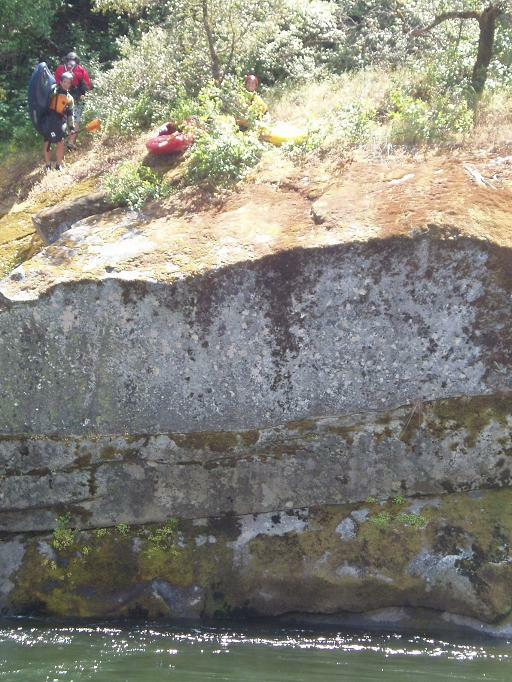 After 100 feet or so of climbing there will be a “White Water Take out” sign and a little parking area down on the right. This is the take out. 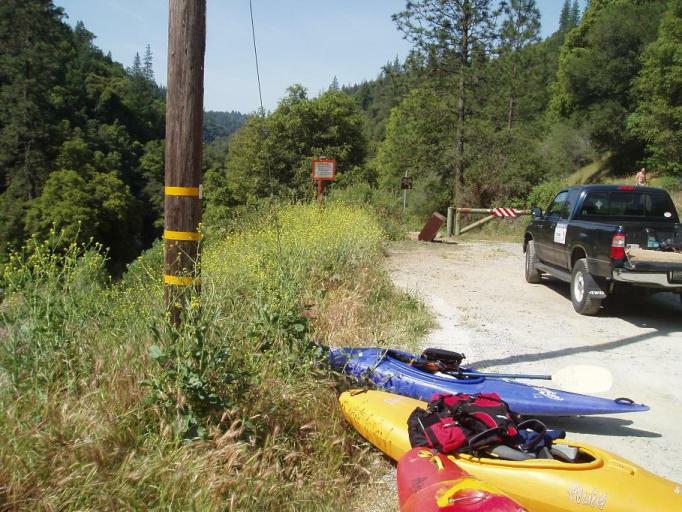 Put in: Continue going up the road that was off the highway. The road is steep for only the first 100 feet. Then it turns to dirt and flattens out. Continue this road for about 3 miles until you get to the parking area at the dam.